When do two wrongs ever make a right? Innocent women are being penalised in a war that is not of their doing. A few days ago a 34-year-old woman, identified only as Siam, whilst on the beach of a popular French tourist town, was asked to remove a layer of clothing and being given an on the spot fine by armed police. There are claims that the situation and pictures were a set-up. If this were to be the case, would this diminish what happened? Of course not. Regardless, if this were a set-up or not, this is an outrageous situation where an innocent woman is fined and asked to ‘undress’ because of a ‘law.’ All indications, despite the claims, are that this was not a set-up. What do the French courts say about a ‘law’ that tells women to undress? French judges have said the ban was ‘necessary, appropriate and proportionate.’ It appears that the law supports three armed officers pointing a pepper spray canister in the face of another Muslim lady and telling her that she was in breach of a new rules outlawing swimming costumes that cover the entire body. On the beach it showed, “Armed police waiting for Muslim women to come out of the sea at Nice, and then warning them about their choice of head scarves.” Women were fined for wearing burkinis, ‘modest swimwear,’ on the beach in Cannes, with details recorded on what will amount to a criminal record. Two young women were made to leave the water by the police even though they were not wearing the burkini. David Lisnard, mayor of Cannes, who introduced the burkini ban, defended the police officer’s behaviour by stating that all ‘beach dress that ostentatiously shows a religious affiliation was unwelcome and offensive and risked provoking people and so risked public order. I honestly struggle to find the words to express my feelings, outrage, dismay and fury about the above situation. A Facebook friend kindly pointed out to me that guns and bombs could be hidden under burkas and burkinis. Silly me for not thinking about that. I knew that weapons and ignitable substances can be and have been concealed under beach towels, in trouser pockets, under coats, in cars, brief cases, backpacks, in shoe soles, and even in body cavities. Quite a knee jerk reaction if ever I heard of one. France’s Highest Court suspends ‘illegal’ burkini ban as ‘serious violation of freedoms. The Court said local authorities could only introduce measures restricting individual freedoms if wearing the Islamic swimsuit on beaches represented a “proven risk’ to public order. And there was no such risk concerning Villeneuve-Loubet, a resort on the Cote d’Azur between Nice and Cannes. What does the Bible say again about how we are to treat our neighbours? Categories: A BIT OF EVERYTHING, NEWS FLASH | Tags: burka, burkini controversy, Cannes, Cote d'Azur, France highest court, French resort, mayor of Cannes, Nice, prejudice David Lisnard, Siam, THISISNOTOK, Villeneuve-Loubet | Permalink. I don’t know about you but I have had and still experience situations in my life where I do not know how to move forward. The LORD shall fight for you and ye shall hold your peace. Imagine the Hebrew slaves being rescued from the Egyptians and then the Pharaoh decided to pursue the poor people with his army. The Hebrew people were caught between a massive army and the sea. What hope was there for them? As we know the rest is history. Moses did as he was told, the Hebrew people safely reached the other side and the Egyptian army was swallowed up by the sea. I’ve heard people say, ‘But what about the poor Egyptians?’ Well actually, they weren’t that poor. They were slave drivers that had abused the Hebrew people for hundreds of years and the Egyptians had a choice. They did not have to go running after the Hebrew people. The Pharaoh could have let the Hebrew people leave in peace as he had promised them. But greed got the better of him and ultimately was his downfall. I love Moses’ faith and I love the Scripture verses that remind us of this. Scripture verses which we can claim for ourselves when the going gets tough. When I was going through rough times in the past I looked in my Bible and found encouraging Scripture verses that corresponded with tough times in my life or that resonated with me because of the powerful words and promises contained within these words. Below are some verses that I’ve put together and sing when encountering dips in the road and tough patches. I hope that these verses will help you too when you go through rough patches. Feel free to share your favourite verses in the comments. “Dear Matron, Please forgive me for the nurse’s cap I stole 50 years ago and accept $20” reads the headline on a News.com.au article which was published a few days ago. From the Scripture verses in Luke and many other verses similar to these, we know that the Bible tells us to restore back to people what was taken from them in error or by deliberate defrauding. The Bible refers here to deliberate defrauding. For most of us it is probably more subtle, as with the nurse’s cap. This story triggered my memory and I remembered one particular incident where I accidently damaged someone else’s property and did not make up for it. Pfew, that really had been playing on my mind and I felt instantly at ease when he mentioned that and resolved to give him something nice for his new house. Funny how we don’t seem to be able to shake these little mishaps where we feel we ‘owe someone.’ It’s called our conscience I believe. Whilst reading the article in the news other memories came up for me about past events. Once as a teenager during News Years Eve, I decided to visit a friend, “just for an hour.” That’s what I told Mum. But I actually stayed away for quite a few hours. I simply lost track of time with too much fun to be had at my friend’s place who had family visiting from all over the country. It is now 40 years later and I still remember my Mum’s disappointment when I woke up the next morning after partying hard. “You said that you would only be out for one hour and you stayed out all night,” she told me. What had happened is that everyone at my home had gone to bed early and Mum had been sitting by herself on New Years Eve. I felt terrible about it and did for a long time after. My Mum has passed on and now what? I would love to be able to reach a place of compassionate understanding and peace for both of us. Not only about this particular event but about many other similar events also. Situations where, often despite my best intentions, I may have hurt people I love the most. What to do? At some stage, you have to forgive yourself for mucking up. One book that really helped me with that is THE GOD SESSION. This book was written by my friend Kathryn Springman. THE GOD SESSION utilises Scripture to help people resolve family issues from millennia ago! Fancy that! I didn’t even know that this was possible. So now, instead of fretting over issues, I become pro-active, read through some chapters of Kathryn’s book and have a GOD SESSION. I highly recommend her book which was written with rev(f)erence to Scripture and is very useful for resolving past and present family and other, such as health, issues. Let me know in the comments if you have any stories about reconciliation that you would like to share. I love to hear from my readers! *NOTE WordPress may put ads on these pages that I do not know about. I cannot actually see these ads, therefore I cannot endorse them. I thank WordPress for allowing me to use their site to host my blog. Categories: A BIT OF EVERYTHING, NEW BOOKS REVIEWS INTERVIEWS | Permalink. “Why is that?” I asked, wondering if some of the Scripture verses on my walls could have triggered that comment. “Because religion is the cause of most of the wars and hatred in the world,” my newfound friend Brad said. “All religions?” I asked him. “What religion would that be?” He quizzed. “I love God’s Word,” I said. “Mmpphh, you’re one of those Christians,” He said. Clearly, Brad was assuming things. What was I to say to that? I did not know what he meant when he said, ‘one of those,’ but I wanted him to like me and not hate me because of my religion. But more than that, I wanted to convey to him that my religion is one of love. And I was not quite sure how to go about that because Brad clearly had preconceived notions about Christianity and what it entails being a Christian or being someone that loves God’s Word. I didn’t know what his preconceived ideas were, other than that they weren’t positive. Maybe it was premature when earlier I referred to Brad as my newfound friend. My daughter had brought him over to fix a couple of leaky taps and a gate that had come off its hinges. I treated him as a friend because I was grateful that he came to fix a few things for a reasonable fee but I do not like it when people refer to God’s Word as fairy tales. At the same time, I recognise that this reference is generally used by people who have never read God’s Word. I did not want him to go on a rant of no return. For the sake of our now seemingly fragile friendship, I decided to find out what got him going like that. He got up again, down. Up once more. He sure was passionate about the subject. “Good question Brad and pertinent too. You’re absolutely right. For all sorts of different reasons lots of ‘believers’ indeed don’t think that these Commandments apply to them. Many are of the opinion that their faith sets them above the law. “I tell you why the Commandments matter. They matter because the Commandments tell us not to kill, not to steal, not to lie, not to commit adultery, not to covet, to honour our elders and so on. This is what God’s Word teaches us right from the very beginning. The Commandments set a moral standard for the whole of society. “Exactly my point Brad. It isn’t for me to judge if anyone is following God’s rules; what I notice however is that many believers follow all kinds of rules but not necessarily The Ten. Wouldn’t it be wonderful indeed if we were to follow those ten simple rules? There’s nothing wrong with those rules, is there? There’s nothing wrong with the Bible either. What’s wrong is that all through the ages and still today, people interpret God’s Word any way they like to suit their own purposes. 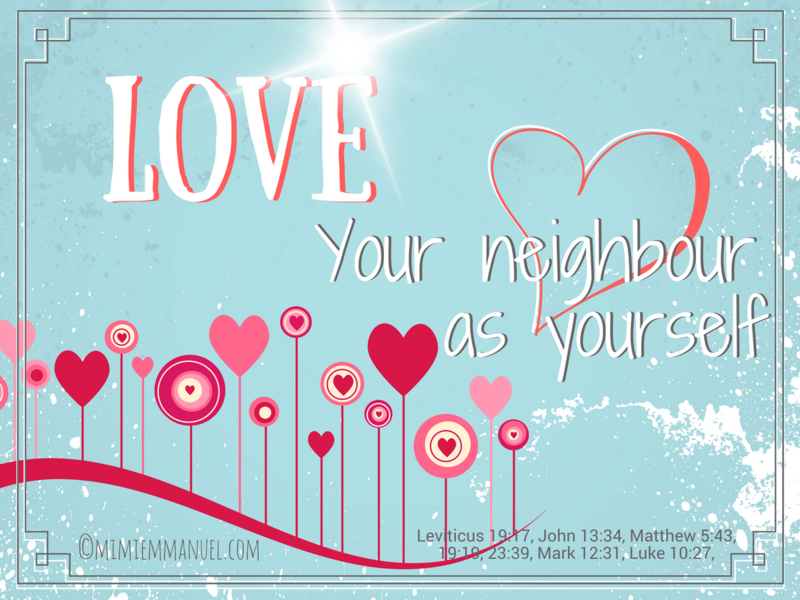 The Bible tells us to love one another. We’re taught that Jesus’ disciples will be known for their love for each other, we’re encouraged to turn the other cheek, bless our enemies and we’re taught that God is love and if we do not love we do not have God in us. “I know that Brad,” I said. “Does that make the Commandments wrong or the people? So Brad, my friend, this is for you. God’s Holy Word from the very beginning from Mount Sinai. Does the Bible tell us what love is? Yes, the Bible tells us what love is. God is love and He tells us that not lying, killing, stealing etc constitutes love. This is love according to the prophets with a little help from 'Moments in Love.' Music courtesy of Art of Noise. I write about this all the time because I am passionate about it. Here is another article that gives you biblical references and here also for our ‘love’ theme. And here is a repeat of the disclaimer for my fellow religious friends who believe differently from me; I love you. *NOTE WordPress may put ads on these pages that I do not know about. I cannot actually see these ads therefore I cannot endorse them. I thank WordPress for allowing me use their site to host my blog. Categories: A BIT OF EVERYTHING, GOD'S HOLY WORD RESOURCES, PROMISES AND PROPHESIES, WHAT IS LOVE? | Tags: 1John 5:2, Deuteronomy 5, Exodus 20, John 13:35, Mark 9:37-39, Moments in Love by Art of Noise, The Bible tells us in detail, this is love, what is love | Permalink.